MPEG-4 Part 14 kent simple as MP4 is a deegital multimedia conteener format maist commonly uised tae store video an audio, but it can be uised tae store ither data such as subteetles an still images an aw. Like maist modren conteener formats, it allous streamin ower the Internet. The anerly offeecial filename extension for MPEG-4 Part 14 files is .mp4. 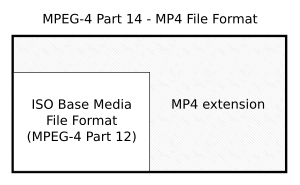 MPEG-4 Part 14 (formally ISO/IEC 14496-14:2003) is a staundart specifee'd as a pairt o MPEG-4. ↑ 3GPP2 (18 May 2007). "3GPP2 C.S0050-B Version 1.0, 3GPP2 File Formats for Multimedia Services" (PDF). 3GPP2: 67, 68. Archived frae the oreeginal (PDF) on 7 October 2009. Retrieved 2009-06-12. This page wis last eeditit on 5 Mairch 2018, at 00:57.